Gubernatorial candidate Adam Cote speaks at the Democratic convention Saturday in Lewiston. With seven candidates in the Democratic primary for governor, there is a candidate for every preference. From moderates to liberals to business people to lawmakers to lobbyists, each candidate brings a different resume to the race. And while all seven agree on the broad outlines of policy — universal health care, a strong safety net, restrictions on gun purchases, restoring civility in Augusta — they differ on how such policies would be enacted. There are also four women on the Democratic primary ballot, a historic high. Unlike their Republican counterparts, Democratic voters have a diverse slate of candidates to rank on the June 12 ballot. We recommend that Adam Cote be their top pick. The race will likely come down to three candidates: Mark Eves, a family therapist and former House speaker; Janet Mills, Maine’s attorney general and a former lawmaker and prosecutor; and Cote, a lawyer, businessman and veteran. Mills, from Farmington, has a strong resume and, as attorney general, has served as a responsible check on some of Republican Gov. Paul LePage’s worst — and sometimes unconstitutional and illegal — impulses, such as removing young adults from the state’s Medicaid program. When the governor eschewed bold action to combat the state’s opioid crisis, Mills joined a lawsuit against the makers of an opioid addiction treatment medication for maintaining their monopolies and inflating prices and she used settlement funds from other lawsuits to equip first responders with the anti-overdose drug Narcan. Mills was elected to three terms in the Maine House of Representatives, where she served on the Appropriations Committee, and served four terms as the district attorney for Androscoggin, Franklin and Oxford counties. She co-founded the Maine Women’s Lobby to advocate for abused women and is the state’s first female attorney general. 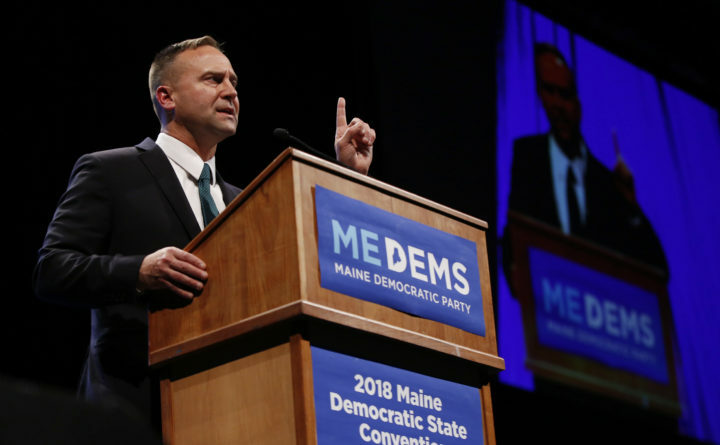 Eves, a more progressive candidate, was House speaker during the early years of the LePage administration, offering a counter to LePage’s push to cut spending and reduce services. Eves wrote and passed important legislation aiming to protect Maine’s seniors — including a housing bond and a doubling of the property tax fairness credit to lower property taxes. He also worked to raise the minimum wage for teachers to $40,000 a year, although that legislation was vetoed by the governor, and supported a surtax to increase state funding of K-12 education. During this campaign, he has taken on the NRA in a push to ban military-style assault weapons, high-capacity magazines and bump stocks in the wake of deadly school shootings across the country. Either would be a strong choice. However, Democrats have a long record of backing candidates who fit the party mold and who are deemed to be next in line. This has not been a path to electoral success. Democratic candidates have not won a statewide race since Gov. John Baldacci was re-elected in 2006. His political resume is short — he served on the Sanford School Committee and ran unsuccessfully for Maine’s 1st Congressional District in 2008. But his leadership resume is long. As a 20-year member of the Maine Army National Guard, Cote served three overseas deployments, in Bosnia, Iraq and Afghanistan. In Afghanistan, he took over command of an engineering unit that had leadership failures, while continuing to command his own unit. He earned the Bronze Star for this work. He earned an Army Commendation medal for his leadership after the deadliest suicide attack during the Iraq war, which killed 22 Americans in a dining hall. In Maine, Cote works as a renewable energy consultant, and he co-founded a business that helped customers buy electricity at off-peak times when prices are lower. All the candidates for governor talk about the need for workforce development to grow Maine’s economy. Cote offers a new approach. His human capital investment fund, for example, would use up to $100 million in bond money to build effective, continuous workforce training so that workers in declining industries would be ready for new jobs in new fields. The program would focus in part on removing hurdles, such as lack of child care and the high cost of some training programs, that stand between workers and better jobs. He would bring return on investment and program effectiveness measures to state spending decisions, with a focus on job creation and poverty reduction. Such innovative approaches, on numerous issues, make Cote a top choice in the Democratic primary. Betsy Sweet, an advocate and lobbyist, should not be dismissed and may rise to the top tier of Democratic candidates. Her message of inclusion and taking care of the state’s most vulnerable residents is especially appealing to young voters. Ideas such as offering Mainers two years of community college tuition free in exchange for a year of service and revamping the state’s corporate taxes to incentivise businesses to pay higher wages and invest in green energy are worth pursuing. Diane Russell, a former state representative, is also full of energy and has long backed progressive policies, such as marijuana legalization and ranked-choice voting, often before they have become mainstream. Mark Dion, a state senator and former Cumberland County sheriff, brings a unique background to the race. As a law enforcement officer, he saw firsthand how the state’s failure to provide adequate systems to deal with mental health care and substance use pushed these problems to the local level. We also appreciate his honesty about the need to raise state taxes to rebuild state government after LePage. The final candidate, Donna Dion, a former Biddeford mayor and school committee chair, has extensive municipal leadership experience. With ranked-choice voting in the June 12 primary, Democratic voters have an opportunity to rank all seven candidates in order of preference. We recommend putting Cote at the top.